/ How Much can the Average Man Bench Press? You’re probably wondering how much can the average man bench press? Bench pressing is a popular exercise which a lot of people enjoy, and which many perform on a regular basis in order to improve their overall body strength levels and to build more muscle. 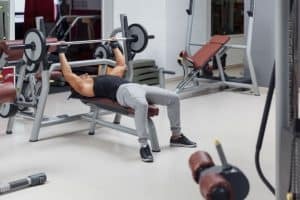 It is recommended to make sure that you bench press with the correct amount of weight in comparison to your bodyweight; otherwise it can make or break the entire workout altogether. 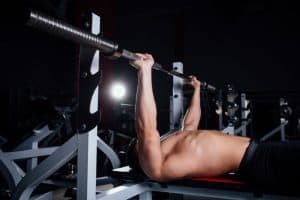 The amount of weight you will be capable of carrying largely depends on how long you have been practicing the bench press, meaning bodyweight and expertise play a big part in determining the correct amount. 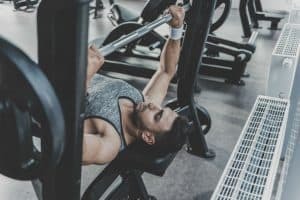 If you are looking to improve your bench pressing skills, or if you are just curious to find out what the average man is capable of lifting when it comes to the bench press, then no need to search further as we have all the answers for you! We will look at why determining your lifting weight is important, as well as how much weight is recommended for the average man based on his level of expertise with bench pressing. Finally, we will share how you can find your exact lift weight suited to your bodyweight, so read on to find out! Why is the amount of weight important? 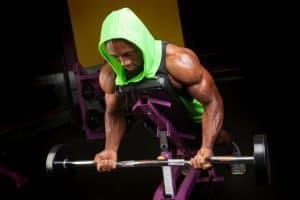 When it comes to bench pressing, it is important to understand just exactly how much your bodyweight can lift, and to make sure you are lifting the right amount. This is crucial information as you don’t want to spend hours and hours training with the wrong sized weights, only to not receive any results after putting so much time into your workouts. Similarly, you also do not want to be lifting weights that are just too heavy for you, and not realize in the process that you should actually be lifting lighter weights. Too much will obviously lead to more problems down the line, such as a severely strained back, or in the worst case scenario a broken or torn pec which is not desirable at all. When it comes to determining how much you can actually lift, first you have to take into consideration your level of expertise with the exercise. This will give you an overall idea of how trained your muscles will be to handle the weights. The guessing can then be done by looking at the different stages of the average bench presser. On average, a man should be able to lift at least his own body weight, while a woman should be able to lift at least half. 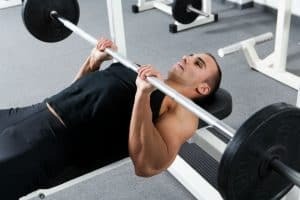 Ultimately, if you are new to the gym, and perhaps aged 20s – 30s, as a minimum it would be expected for a man to bench press his own body weight. Everyone weighs a different amount, and so it is important to focus on what you are lifting as a proportion of your actual body weight, rather than thinking you should be able to lift X amount or do Y amount before even preparing your body to become accustomed to the exercise. A reasonable beginner example could be around 175 lbs. for 1 rep. If you have been bench pressing regularly, training often and your muscles are strengthening, then by this point you should be able to lift around 125% of your total body weight. This could be around 220 lbs. When you reach a more advanced level, this means you have been lifting for many months and have built up a stamina for lifting heavy weights, more than your own body weight. Therefore, at this stage probably around 150 % of your bodyweight is the average here, with an expectation to lift 330 lbs. or more. Elite lifters are likely to be those who are already stronger in terms of their genetic predisposition to have strength, but also really strong in terms of their conditioning training and everything else. This means they will be capable of lifting a lot more than their own body weight. The highest bench press record in the Guinness World Records is currently a weight of 884 lbs., by a man of 375 lbs., which is over two times his own body mass. This is an example of extreme bench pressing, and is of course not recommended to those who are just starting out or regular trainers. Another effective way to evaluate an average man’s lifting strength is to look at similar exercises which work multiple muscle groups. Having this in mind, the average trained man can squat around 125 lbs., bench press 135 lbs. and deadlift 155 lbs. How to determine your correct weight lift? Once you have determined your place within the strength levels, it then makes it easier for you to find out exactly how much weight you should be lifting. There is an online guide which shows a variety of bodyweight ratios both for males and females, and which can be extremely useful in finding your precise lifting weight. This can be found online at strengthlevel.com. Doing this will help you to be more accurate on your level, so your next bench press session will be a lot easier. Keeping track of your weight amount this way is also a good idea, as it will allow you to realize where you are at and what you need to lift should you want to build a greater muscle mass. When it comes to bench pressing, it is clear that many people enjoy lifting weights which are heavier than themselves, often in order to prove their level of strength. However, it is really useful to know just how much you should be lifting for your exact level, and how it will affect your body overall. 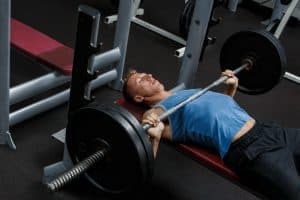 We hope that this article on the average weight that bench pressers can lift has helped you to understand better about the benefits of finding out your exact lifting power. Hopefully the next time you go to bench press, you can make a much better informed decision on whether to lift that 440 lbs. bar or leave it for the 175 lbs. one instead.